The Stranger just premiered the new video for my song Strong Swimmer, along with this really BEAUTIFUL write-up. The response - in emails, direct messages, tweets, Instagram posts & texts - has been unbelievably moving and powerful. It made me think that maybe I should use my news page here for an actual bloggy-type post and share some back-story about how the video came to be. Over the past couple of years, on tour and at home, I've met a number of young people in the midst of really painful gender identity (and in some cases mental health) struggles. And I've known for a while that if I ever made a video for my song "Strong Swimmer," I wanted it to be for them. But I wasn't sure how to tell their story in a sensitive, meaningful and transformational way. Not yet anyway. Enter my young niece Mackenzie (now 14), who lives here in Seattle. In talking with her about all of this stuff it became clear that these ARE the questions teenagers are asking these days - everywhere (maybe even more so in super liberal Seattle?! I'm not sure). Anyway, I told her I wanted to do an art project around it and wanted her help, but I didn't have a very clear vision yet and she wasn't all that compelled. She's a super creative kid though, and around that time she was just starting to take up visual art. She'd started drawing these characters - all different blends of gender traits, clothing styles and names she'd made up. It was becoming her main creative outlet and I thought it was such an interesting reflection of all the questions facing her age group. She gives all her characters similar facial features, but one day a character is named "Kenny", the next it's something like "KenKen," or "Paloma" or "Misell" or whatever persona she feels like giving them, gender norms be damned! I found it fascinating. And the drawings were SO GOOD. THEN...Halloween 2017. I asked Mackenzie what she was dressing as and she replied "one of my characters." I was like "Whoa, cool! Can I see it?" She showed me this amazing drawing of a sort of gender-neutral kid she'd named "DoodleKen" wearing an outfit she'd dreamed up, complete with a cape and a sword. It turns out she not only drew the character, but she SEWED HERSELF A CAPE(!) and MADE HERSELF A SWORD(!) out of a yard stick & duct tape, and went trick-or-treating as her own self-made super-hero!!! I immediately thought "holy smokes! THERE'S our video concept!" Because why shouldn't kids get to completely create their own identities these days? And once they get through all the muck and pain and uncertainty, the identity they create gets to be POWERFUL. "I want to preface this email by telling you how much I've been thinking about this. I've been taking time and wondering about whether to approach you with my thoughts or not....I'm curious about what you're hoping for as a final end product with your video... is this purely the experience about the challenge of trying something new? Or, are you hoping to end up with something more professional? Are you taking it into your own beautiful and creative hands because it's more about a special experience with your niece? AWESOME if so...I suppose, ineloquently, what I'm trying to say is that I'm so inspired by Mackenzie, the song, and you in general, and I'd like to offer my co-directing/ shooting/ editing skills to you for this project... I would scrounge up styling, hair and make up, a couple more additional locations to round out the story, etc. but ultimately it would closely follow your treatment and shot list. No dollars involved....I'm approaching you with this because I think the voice you're creating with this is really important. And I see the ways I could help to make it as loud as possible." Mackenzie and I were totally floored and immediately said "YES, PLEASE!!!" So we started over - shot everything from scratch - with Genevieve at the helm. She helped to shape & fill out the storyline in crucial ways, brought an amazing team on board who believed in the heart of the project (including the AMAZING Christopher Harrell, another wicked talented director here in Seattle who came on board to co-direct), and shot & edited everything to perfection. She and Christopher also directed Mackenzie (& the other actors) on set in the most gentle, effective and loving ways, it was amazing to watch! I can't get through 30 seconds of this video without crying. And I can't think of a single thing I've ever been a part of making that makes me more proud. Some of you you know that the song itself has it's own back-story, but if you missed that you can listen to a lovely NPR Weekend Edition piece about it HERE. Exclusive Video Premiere for "James" on KEXP! We love Nancy Guppy and were super honored to be featured live on her special "vinyl edition" of Art Zone last week! If you missed it on TV, you can watch it right here on the Seattle Channel! The Man Who Made Himself a Name is IN STORES NOW!!! Or come to a show sometime soon! I would love to see your face. Hear the Full Album TODAY at Pure Volume! The new album hits shelves TOMORROW(! ), but you can listen to the whole thing today (a day early!) at Pure Volume! Click on the pic to hear THE MAN WHO MADE HIMSELF A NAME! Check out the 2nd single from Shelby's new record, THE MAN WHO MADE HIMSELF A NAME, exclusively at Impose Magazine! LIVE ON KEXP EVERY DAY THIS WEEK! File this one under "craziest things I've ever done:" John Richards of KEXP 90.3 invited me to stop by The Morning Show at 8:30AM (PST) EVERY MORNING THIS WEEK to play a live acoustic version of a new song off the new album, THE MAN WHO MADE HIMSELF A NAME, and I SAID YES! If you're in Seattle you can tune your dial to 90.3 FM, or if you're elsewhere in the world visit kexp.org to listen in! KEXP 90.3 "Song of the Day" Podcast! I'm excited to announce the "The Man Who Made Himself a Name" (the title track off the new record, produced by Martin Feveyear) is KEXP's Song of the Day today! Have I mentioned how much I love this radio station and all the people at it? Like, until the end of time. Read all about it HERE! Album Release Show ON SALE NOW! I am THRILLED to announce that my new record will be released nationally on March 10th, 2017 via Nine Mile Records/Red Eye (more news of that + NEW SONG PREMIERES coming very soon!). I'm also excited to announce that tickets for our album release celebrations in WA State are ON SALE NOW! SAT, MARCH 4: TRACTOR TAVERN, SEATTLE, WA - OFFICIAL ALBUM RELEASE SHOW (Presented by KEXP) featuring SHELBY EARL & FULL BAND (+ special guest Josiah Johnson! ), SILVER TORCHES & PLANES ON PAPER. Tickets and info HERE! FRI, MARCH 10: THE BARTLETT, SPOKANE, WA - Release Day Celebration w/ PLANES ON PAPER. Tickets and info HERE! SAT, MARCH 11: GESA POWER HOUSE THEATRE, WALLA WALLA, WA - Album Release Celebration w/ PLANES ON PAPER. Tickets and info HERE! MORE TOUR DATES TO BE ANNOUNCED VERY SOON! If you would like to be the FIRST to get info on all of the above, you can sign up on the mailing list HERE. Looking forward to celebrating with all of you very soon! It's been a quiet year on the "news" front because I've been holed up at home in Seattle making a new record and focusing on my personal life, but I'm excited to announce that I'm getting back in the world and out on the road! 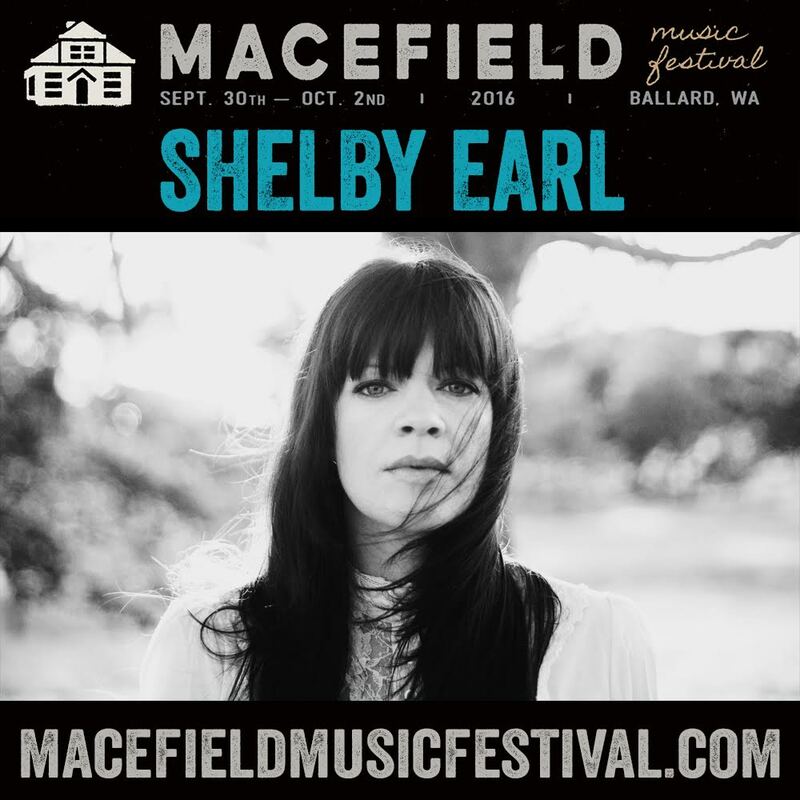 I'll play a band show this Friday in Seattle, at my home venue, Tractor Tavern (as a part of the fabulous Macefield Music Festival!). And then next month I'll hit the road opening for the talented the Felice Brothers. See below and on the TOUR page for details. Hope to see you around the bend! New Video in the Wall Street Journal! Remember that terrifying article about "The Really Big One" in the New Yorker? Well, it inspired some art-making, in the form of an "apocalyptic love story" video for my new single "Stay With Me Tonight (feat. The Spectacles)." The Wall Street Journal has the full story and the premiere right HERE! 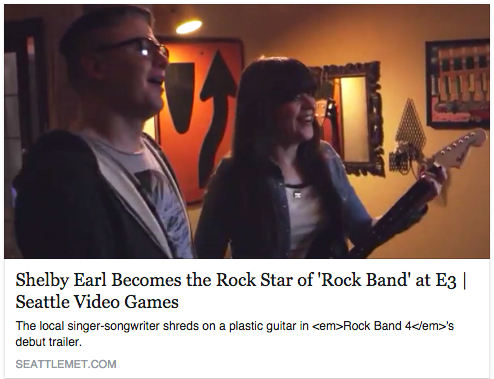 Check out the teaser for the new Xbox Rock Band 4 game, featuring yours truly on lead guitar! The video was a blast to film and it premiered today at E3, the world's biggest gaming conference! Click on the photo to watch the video! We were super excited to see the video for our new holiday track, "We Three Kings," featured on Entertainment Weekly today! The song is an exclusive for Amazon.com's ALL IS BRIGHT holiday compilation. You can visit here to download the song, and here to watch the video! There is a wonderful new way for artists and patrons collaborate in making art happen and the whole thing is launching this week, right here out of my hometown, Seattle, WA. It's called ZIIBRA and you can learn more about it - as well as how to get involved - by clicking on the pic below. I'm excited to watch this wonderful arts community grow! Swift Arrows VINYL: IT'S HAPPENING! BIG NEWS! Spark and Shine Records is putting out the Swift Arrows LP (ON PINK VINYL + Digital Download w/ 2 PREVIOUSLY UNRELEASED TRACKS!) on Jan. 21st, 2014! You can PRE-ORDER it now along with a special, limited-edition beanie cap! Also, if you'd like to make it a gift, we'll even send you a printable gift card in time for the holidays! It's National Release Day for Swift Arrows!!! It's national release day for my sophomore solo album, Swift Arrows! JOY!!! You can STREAM THE WHOLE ALBUM FOR FREE (today only) and purchase a digital or physical copy at Bandcamp, CD Baby, Amazon or iTunes. If you're in Seattle you can pick up a copy at Sonic Boom, Easy Street, Everyday Music or Silver Platters. If you missed the release show last weekend, come by Sonic Boom Records, Ballard at 6pm TONIGHT to catch the encore show! Lastly, I really hope you enjoy the new tunes. 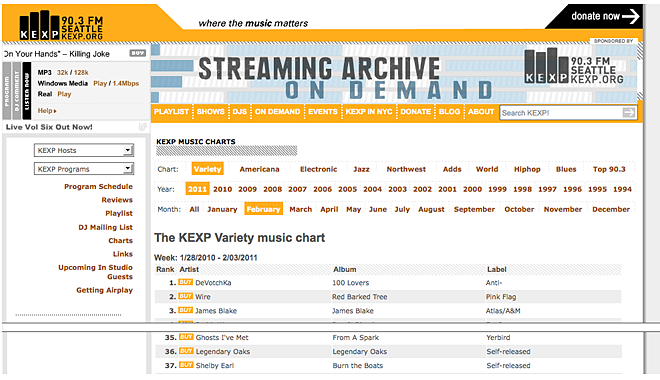 KEXP 90.3 FM - The KEXP Variety Music Chart #37!